First of all, you should correctly cut the cable. Its better to use special equipment (type НТ-332). By few turns of the tool, we are making two cuts on both hands of coaxial cable on the desired distance. Depth of cut is regulated and must be installed, the blades do not notched cable central core conductor and braid. To avoid damaging the blades, do not use excessive force on contracting notched areas using a tool, if the blades in the tool did not display accurately. The first section can be easily removed by hand, just crank it for a half turn. The second portion (piece outer shell) can be conveniently removed by cutters. Verify that the center conductor and the braid, do not have random remnants of foil and braid wires, which can cause circuit. In the absence of a tool HT-332, preparing can be done with a conventional knife.. Central core should be bare by 7-8 mm, outer shell with braided cable removed at 6-7 mm. 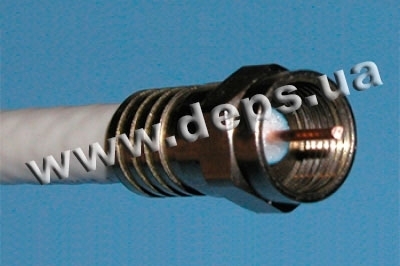 Cable armor wrapped over a shell and put on connector. Make sure that the connector is fully sat down, the end of the inner sleeve connector should be pushed forward and do not reach the edge of about 2 mm.. When you first connect the sleeve, it goes deeper, firmly fixing the connector on the cable. Mounted connector Trilink F 6CL looks very compact, neat and kept very tight, to remove it from the cable is almost impossible. If necessary, shorten the exposed end of the central conductor by wire cutters.